I was looking through you tube videos and came across the title "Funny Biting Parrot". 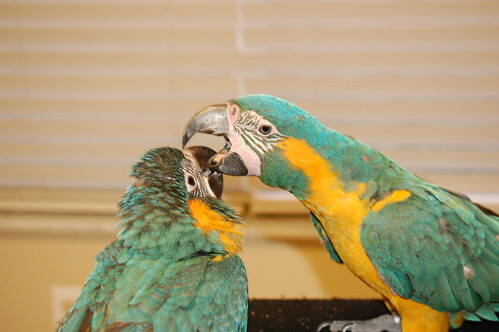 I thought to myself: what can possibly be funny about a biting parrot? and I watched the video. I did find it funny. When you watch the video, there are a few clues that tell you this is not aggression, but a game between parrot and owner. First, the owner is encouraging the bird and is clearly unafraid of a serious bite. Secondly, there is no aggressive body language in the bird – just the lunge to connect with the owner with no intention of inflicting harm. And thirdly, no one in their right mind puts a truly aggressive bird in a well traveled area of the house leaving only a foot of clearance. Is it a good idea to encourage a game like this? Maybe not, but different parrots will find different ways to play. When I come home from work, one of the first thing I do is collect and clean bowls from the cages. It never fails that when I am bent over reaching my arm into the cockatiels cage to get their bowl in the back of the cage, my quaker comes charging across the top of their cage, straight at my face. When she arrives within a fraction of an inch, she throws her wings out, gives a loud call, turns, and runs away laughing. Anyone witnessing this from behind would expect to see me missing an eye when I turned around. This is hilarious good fun to her, and me. A friend of mine tells me her scarlet macaw routinely engages her boyfriend a mock “attack” when he comes to visit. He is barely inside the door when Georgia runs to him and pecks furiously, but harmlessly, at his calf. Then she runs away, screeching, down the hallway. This is Georgia’s way of initiating play with him. For the next 30 minutes or so, they are chasing each other all over the house. Then he realizes he has yet to say hello to his girlfriend. Linus, my umbrella cockatoo, is wonderful when it comes to independent play. He can, and does, entertain himself for hours on end in his cage. There are times I open his door and he prefers to remain inside with a favorite toy. I would not like to be reincarnated as one of his parrot toys. He can be brutal with them. He yanks, bites, and batters his toys with everything he’s got. Sometimes he just stands there and yells at them. But yet he loves them, sleeps next to them, and sometimes just quietly watches them. It his own style of play. A co-worker, after observing a particularly loud and rowdy play session asked me: “You don’t ever let him out, right? ?” I laughed, but could fully understand why she would fear for my safety. He did look like the embodiment of evil that day. When you think about the way young parrots play, or any animal for that matter, there is a lot of rough housing going on. Rolling, biting, growling – all in the name of good fun. Mutual trust between the two players allows it to be nonthreatening. If one player goes too far, the other quickly lets him know and boundaries are established. Bonds between humans and animals are maintained the same way. 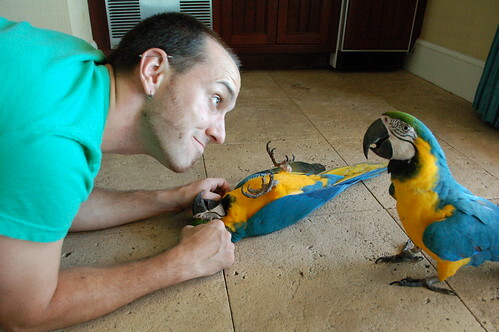 Many people have accumulated such trust with their parrots that they can do nearly anything with them. One friend can hold her cockatoo’s feet in one hand and swing her around in huge circles. This is a favorite game. Another friend will sneak up on her parrots and yell: “BOO!”. Of course, they fly off in every direction in an uproar, but then they return to the same spot to do it all over again. It is bonding and trust that make it understood that these are not acts of aggression, whether the instigator is human or parrot. This was great info! My scarlet macaw will climb all over me sometimes, nipping me while he laughs. At first I thought I wasn’t doing something he liked, but learned that’s his way of playing. Thanks for the article!